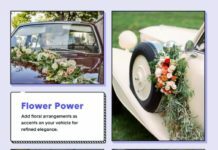 When it comes to weddings, there is an endless to-do list that can get quite overwhelming, House Estate Houston Wedding Services is the place to start. Just when you think you’re caught up and in a good place, you remember a few things that slipped your mind. 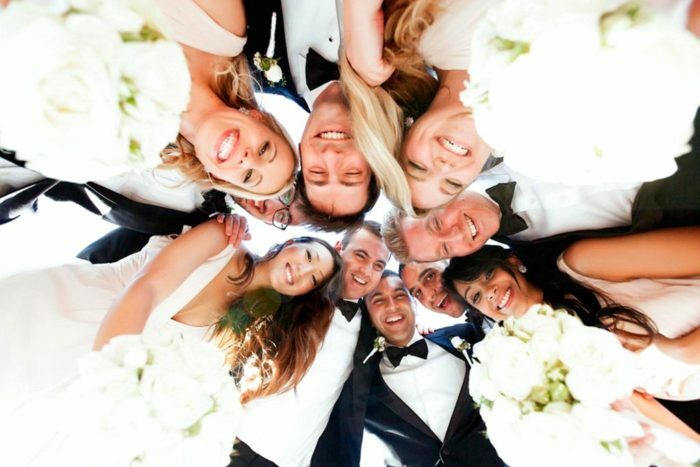 One thing is for sure, you need to give thanks to the most special people in your life; the great friends and family that you carefully chose to be in your bridal party. 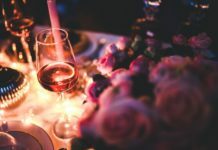 Following months of helping you plan your big day, hosting that shower and bachelor or bachelorette celebration in addition to helping you on your actual wedding day, it is appropriate to make wedding party gift ideas a priority. These loved ones have done so much to support you to this point, so thank them as they deserve. As anyone planning a wedding can attest, wedding planning would be a nightmare without the aid of family members and friends. These are the men and women who give you guidance when selecting your bridal gown, help you assemble your wedding favors, and lend a sympathetic ear once the stress gets to be too much. 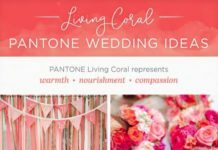 The ideal sort of wedding party gift idea is something private but that doesn’t mean it must be personalized. Give a present to each person that you think he or she’d enjoy. You don’t need to give the same gift to everybody, but you can if you believe it’s something they’d all love and use, like a monogrammed bag or bottle of scotch or whiskey. Alcohol and alcohol-related gifts are the most commonly purchased items for guys. 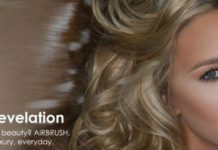 For women, jewelry and beauty items are at the top of the listing. An average price point for these wedding party gifts is around $50 but can be more or less depending on your budget. 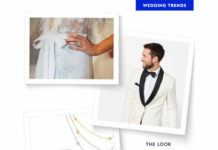 We’ve put together a fun collection of unique personalized wedding party gifts that will be sure to put a smile on the faces of both your bridesmaids and groomsmen. Enjoy! Everyone needs a good recharge after a long day at work. So when you hang up those keys, sets aside your time-tracker, and plug in that electronic leash, you’ll need somewhere to keep them organized. This Personalized Docking Station does just that! This ideal gift gives you the chance to roll out of bed and be on the go in no time because all of your daily ingredients are finally in one place. 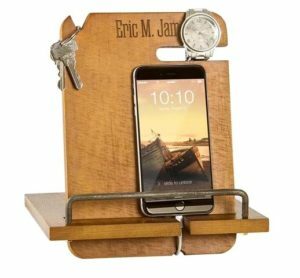 This fir wood, multi-functional docking station features a slot for watches or bracelets, a keychain notch at the top, and a groove along the bottom for charging cords. Personalize this gift and it will take a primary spot on anyone’s nightstand or desk. No doubt this is one of the more cool and distinctive gift ideas going. 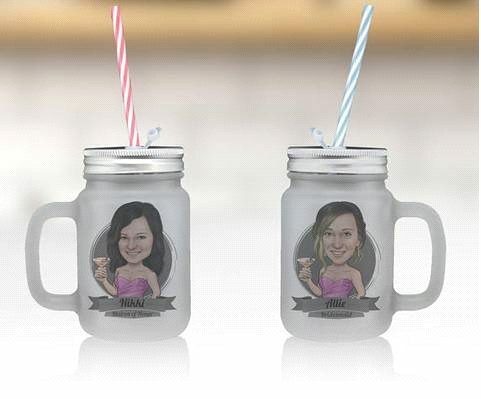 If You Like Pina Coladas…or if you’re into champagne, you’ll love these Caricature Mason Jars for your own lovely ladies! How fun are these beautifully personalized mugs? They’ll create one for each of your bridesmaids based on photos you provide and then print onto the jar digitally using a high-quality process. The mason jars are insulated to keep your favorite beverages cold and have a screw-on lid to keep drinks potent even if they get caught in the rain. You won’t find a gift this unique on most other sites, that’s for sure! All custom portraits will receive a proof for your approval before printing. 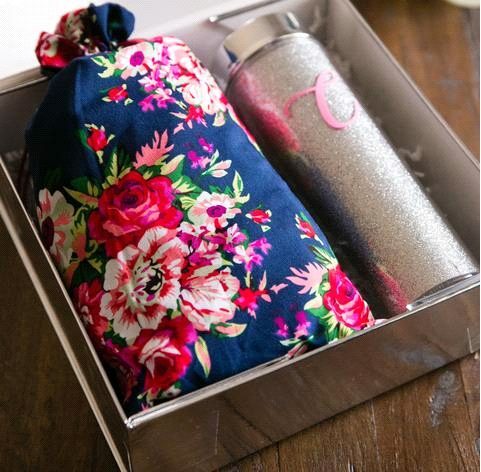 Imagine the excitement on your bridesmaid’s faces when they open this distinctive and thoughtful present. They came to celebrate your wedding; they’ll leave celebrating this gift. The Total Package is right! A Whiskey Decanter Set makes the perfect personalized gift for groomsmen! 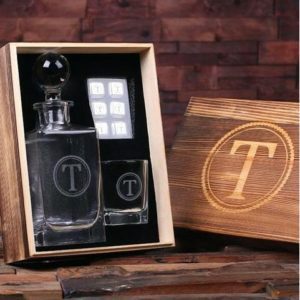 Give the men in your wedding party the ultimate trinity of advanced drinking essentials with a gift that will dance in their hands when they open it. Guys, they can be a bit primal as drinkers, so help advance them to a more civil place. Pull them away from the koozy and Bud Light, and help them next stage the way they throw them back with a little needed sophistication. The decanter size is 1 liter, and the whiskey glass holds 8 oz. You can store the steel whisky stones in the freezer as they come in a tidy container. Engrave it however you’d like and POW!, an amazing groomsmen gift they’ll all appreciate. 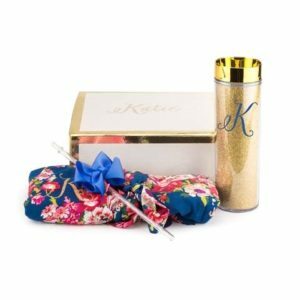 Give your bridesmaids a little more sweetness with this Robe and Tumbler Box Set – the perfect addition to your upcoming wedding morning. While you and your closest ladies are busy getting ready for the day, you can all relax in these gorgeous, silky robes while sipping on something yummy – mimosas, anyone? The stylish tumbler and gift box in this amusing package come in both gold and silver sparkles, with the vinyl decal coming in several color options. The comfy robe can be customized with any a variety of foil and glitter colors. The robe comes in One Size Fits Most and Plus Size. 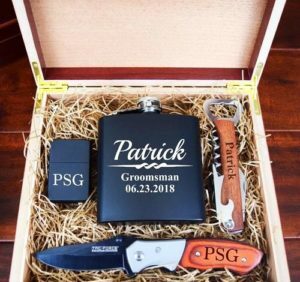 The guys over at Groovy Groomsmen Gifts call it The Termanator, and this gift box will certainly terminate all the fears of gift giving. This is an offering that bundles a cornucopia of manliness in one nifty box. The gift glow that emanates from this box would be enough to put a smile on Arnold’s mug, with a collection of goodies that will tickle the fancy of the pickiest of pals. No need to put all your eggs in one basket, when you can put a melting pot of fun in one cool box. You can say Hasta La Vista Baby to all other gifts when you serve up gift perfection with this collection. The TerManator is a Wood Box (doubles as a humidor), Pocket Knife, Lighter, Corkscrew Bottle Opener and Flask. 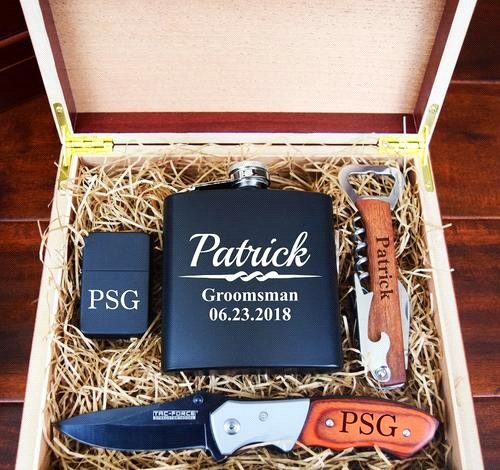 Place this set in a box, add personalization, and you have a groomsmen gift built to please. Whether its wings or wheels, a trip with your girls begins with this terrific tote! 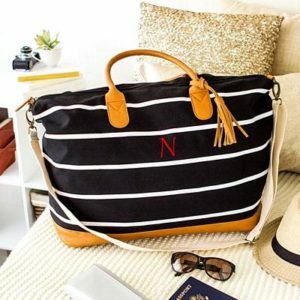 This Striped Canvas Bag can be personalized with your ladies’ initials so they can roam around the world and rocket through the wilderness with a unique twist. This practical bridesmaid gift is a perfect way to thank all of the women in your bridal party! 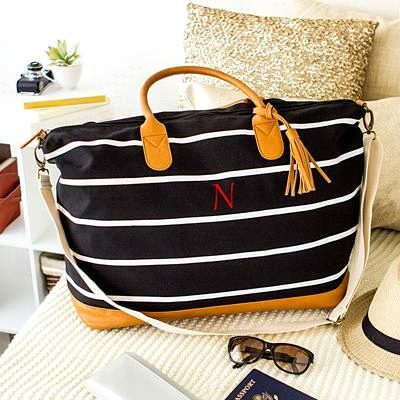 Whether it’s a beach getaway, a cabin retreat, or an overseas jet set, this over-sized travel bag is the perfect addition to ANY travel plans. 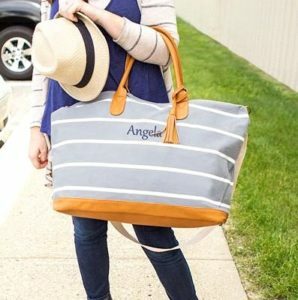 The bag features a chic stripe design, a zippered inner pocket, faux leather accents, and a removable cross-body strap. Rock it hip to hip or by the handles! Choose from a grey or black striped tote and a wide variety of thread colors to match with each of your bridesmaids’ tastes. I hope you enjoyed the wedding party gifts we highlighted for you. 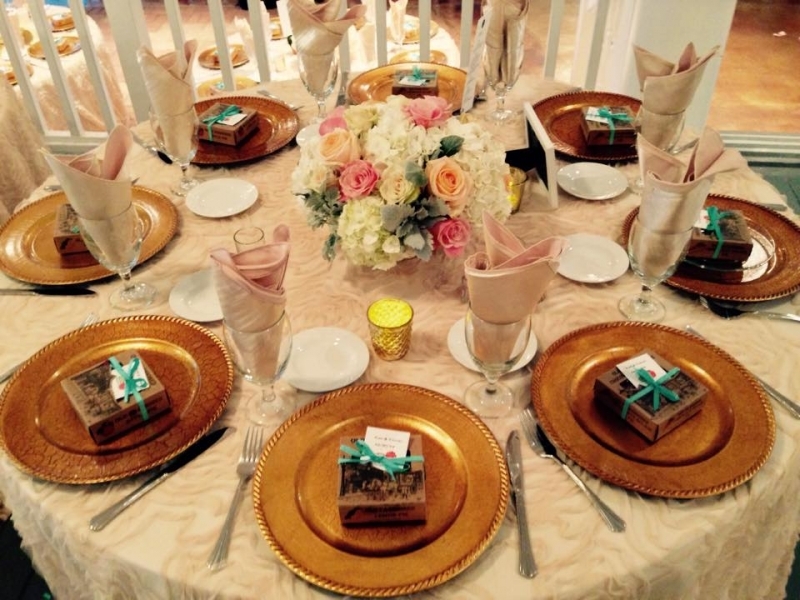 They would make fantastic offerings for the special people in your bridal party. 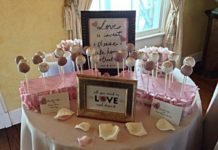 And if you’re looking for wedding favor table gifts, Forever Wedding Favors has some adorably personalized table top presents that will have your guests leaving your big day with a smile.